FRENCH LICK, Ind. 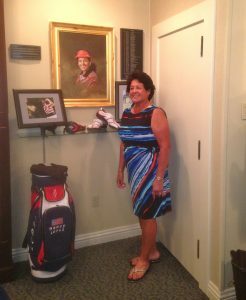 — Jane Blalock and Nancy Lopez will be inducted into the LPGA Legends Hall of Fame on Thursday night. They’ll also oversee ribbon-cutting at the circuit’s new Hall of Fame at the West Baden Springs Hotel. Steve Ferguson, chairman of the board of the Cook Group, celebrates the opening of LPGA Legends Hall of Fame with inductees (from right) Jane Blalock, Nancy Lopez, Jan Stephenson and Kathy Whitworth. The big night precedes Friday’s start to the 54-hole LPGA Legends Championship on the spectacular Pete Dye Course here. Both Blalock and Lopez will play in the three-day event, but receiving well-deserved recognition for their golf accomplishments will take precedence. Lopez has been one of the most popular players ever in women’s golf, having won 48 times on the LPGA Tour before moving on to the Legends circuit. Blalock was a gritty competitor, too, as shown by her 29 LPGA titles and LPGA record for most consecutive cuts made (299) but her efforts off the course overshadow her stellar playing record. Without Blalock there would likely be no Legends Tour. She, along with 24 other senior players, put in $5,000 apiece to get things started in the 1990s. They didn’t receive much support from LPGA headquarters then but – led by Blalock as chief executive officer – the Legends Tour has carried on. Nancy Lopez checks out her own memorabilia in the Legends new Hall of Fame. And, operating with a small staff from her Boston office, she’s run it well. It hasn’t been the smoothest ride since then. The Green Bay event, which had a $500,000 purse, thrived for three years and another popular tournament in DesMoines had a four-year run. Both had changes in local leadership, though, and didn’t survive. 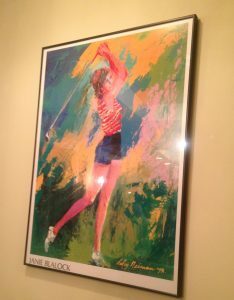 Still, the circuit managed to put on several events each year and the same players were even more successful in Blalock’s other golf venture – a series of one-day clinics under the banner of LPGA Golf Clinics for Women. The clinic series is in its 24th year and the Legends Tour in its 14th. This week Blalock revealed some big news for the circuit. Walgreen’s has signed on for two more years to host tournaments in Phoenix and Delray Beach, Fla., and Juli Inkster, winding down her career on the LPGA circuit, has agree to join the Legends for its Handa Cup team event in Mississippi next month. It’ll be played at the Old Waverly course where Inkster won the 1999 U.S. Women’s Open. Last year the Legends had 11 tournaments. This year there’s seven but the number will be up again next year. 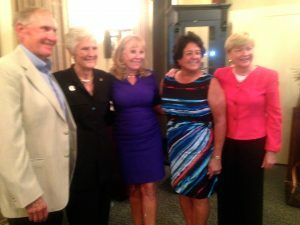 Blalock expects to have at least 10 events when the 2015 schedule is announced and the circuit could grow dramatically in subsequent years if the long-discussed U.S. Women’s Senior Open becomes a reality. The U.S. Golf Assn. is considering creating such a championship, and president Tom O’Toole said meetings with Legends members on the topic at both Phoenix and Pinehurst, N.C., weren’t just “lip service’’ on the USGA’s part. The LPGA is supporting the Legends’ cause as well. 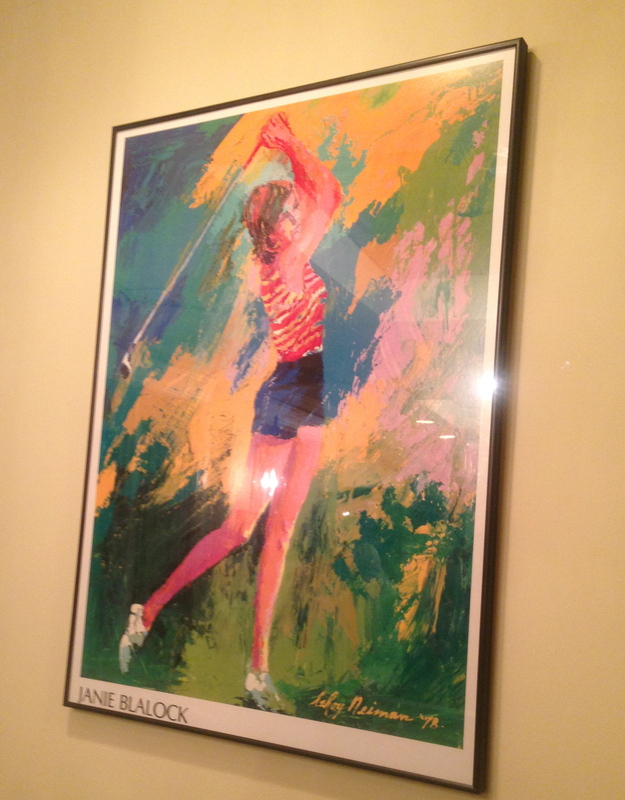 Famous artist Leroy Nieman captured Jane Blalock in her playing days. To stimulate more interaction with the USGA the Legends offered invitations to both the winner and runner-up from the U.S. Women’s Amateur to compete in the Legends’ November stop in Florida and both accepted. One USGA concern was whether there’d be enough senior women willing to compete to make the U.S. Senior Women’s Open a viable championship. Blalock says there are “easily 100’’ who would try just on the pro side and the Legends would provide most of them. Back in 2000 the circuit called itself the Women’s Senior Golf Tour. Many of its players didn’t like the “senior’’ connotation and then the men’s circuit changed its name from the Senior PGA Tour to the Champions Tour. The led the women to change, too.